Surely the Lord GOD will do nothing, but he revealeth his secret unto his servants the prophets (Amos 3:7). America is in Bible prophecy. Isaiah 18 warns of the destruction of America by attackers from a land in the region of Iran, Pakistan or beyond such as southern Asia. This is the reason America does not play a noticeable role in prophecy during the last seven years before Jesus returns. God gives us clues as to what is yet to happen. Isaiah chapter 18 discusses more than one nation. The main country can only be America. What people want is peace and safety. What they will really get is the opposite. You need to know and understand what is to come. Study each verse carefully. Read each section thoroughly before moving to the next. For hundreds of years people have quickly read the passage and moved on to the next chapter without caring enough to figure it out. It is easy to believe a prophecy that has already been fulfilled in the past but it takes faith to believe in one about the future. The scholars who say Isaiah 18 was fulfilled in the past have rushed to judgment. Do not try to force a prophecy to fit an event. Examine whether an event fits the prophecy. No event in history fulfills this prophecy. Isaiah 18:3 says, "All ye inhabitants of the world, and dwellers on the earth, see ye, when he lifteth up an ensign on the mountains; and when he bloweth a trumpet, hear ye. When has the whole world ever seen and heard something? It has not done so yet. It is not clear what the ensign is neither is the sounding of the trumpet clearly identified. This has not happened to date but for the whole world to see and hear it will have to be very significant. When the anti-Christ signs or confirms a covenant with many as mentioned in Daniel 9:27 it may be globally seen and heard. Of the coming great and dreadful things to happen, the rapture is the event we know of that is best described by this. Jesus was a sign or ensign to the nations. We, as his followers, are an ensign to the world. We will be lifted up to heaven. The word used for lifted up is nasa (naw-saw') (Strong's word 5375) which is a primitive root; meaning to lift, in a great variety of applications, literal and figurative, absol. and rel. (as follows):--accept, advance, arise, (able to, (armor), suffer to) bear(-er, up), bring (forth), burn, carry (away), cast, contain, desire, ease, exact, exalt (self), extol, fetch, forgive, furnish, further, give, go on, help, high, hold up, honorable (+ man), lade, lay, lift (self) up, lofty, marry, magnify, X needs, obtain, pardon, raise (up), receive, regard, respect, set (up), spare, stir up, + swear, take (away, up), X utterly, wear, yield. We are not forgiven or pardoned at the rapture but the Christians will be raptured because they are forgiven. They will be lifted up and fetched. A trumpet will sound for the whole world to hear. When this prophecy was given, trumpets were used for several things. One was to gather the congregation together (Numbers 10:7). When the rapture comes, the congregation will be gathered. In the parable of the ten virgins in Matthew 25 the cry at midnight said, "Behold, the bridegroom cometh; go ye out to meet him." All the virgins heard the cry. Five virgins were prepared and were accepted. Five were foolish and when they came later they were told, "Verily I say unto you, I know you not." Jesus will say "I know you not" to the unbelievers. The five foolish virgins were unbelievers. They heard the cry at midnight as well. When the rapture comes as a thief in the night, all of the world will hear about it. The rapture may be the time when this event happens. Another global event in the tribulation is the death of two of God's witnesses in Jerusalem. Revelation 11:1-13 tells us they prophesy for 1,260 days. When they are killed verse 10 says, "And they that dwell upon the earth shall rejoice over them, and make merry, and shall send gifts one to another; because these two prophets tormented them that dwelt on the earth." The whole world will see and hear what happens to these men. Isaiah 18 was given to Israel first. The book of Isaiah in chapter one starts with the introduction, "The vision of Isaiah the son of Amoz, which he saw concerning Judah and Jerusalem in the days of Uzziah, Jotham, Ahaz, and Hezekiah, kings of Judah." It was written for Israel's perspective. Woe or great sorrow is declared for a "shadowing with wings" which sends its messengers to destroy another. A country named Cush is given as a reference. Cush, or Ethiopia as some believe, is not the country which is destroyed. The Bible says woe to the country which sends messengers but the destruction found in verses four through six is for a fourth country which is not named but instead described. The Bible was written first for the Jews. They are the first intended listener. Salvation comes to the Jews first and then the Gentiles second. Any reference given is from the perspective of Israel. To identify the other countries you need to start with Israel. To provide a better understanding of each country's involvement, the phrases of the first two verses are split apart below. Woe to the land shadowing with wings, which is beyond This is the second country. It sends out its messengers to the country which gets destroyed. the rivers of Ethiopia: This phrase is about a third country. It is a reference only. That sendeth ambassadors by the sea, even in vessels of bulrushes upon the waters, saying, Go, ye swift messengers, This part is about the second country again. to a nation scattered and peeled, to a people terrible from their beginning hitherto; a nation meted out and trodden down, whose land the rivers have spoiled! This refers to the fourth country. It is the focus of the chapter. Verse one is about a country beyond the rivers of Cush. The whole chapter, however, is not about that country. Messengers, ambassadors or agents from an un-named nation known as the "land shadowing with wings" or "whirring wings" go to a fourth country to destroy it. Understand, if the United States of America is seriously attacked by another such that there are too many to be buried the offending country will be dealt with harshly in such a way as does not need to be described. Readers find the mention of "Ethiopia" in verse 1 and assume that the passage is about it. The passage is not about "Ethiopia". The real name here is Cush. The real identity of Cush does not change the reference to the fourth country later in the chapter. Cush is a nation that helps identify another nation that is the "land shadowing with wings" which is beyond its rivers from the perspective of the people of Israel. Cush is merely a reference point. I believe this is where most people go wrong. Once they see Cush it is all they focus on. I suspect some with racial biases have found the name Ethiopia in the past and then ignored it because it is about a people and a heritage for which they have no concern. I have noticed some who care about Ethiopia, Eritrea and the surrounding area and then seek to place the country they love into the prophecy. This doesn't work either. What do these references mean? Israel is implied in verse one but the identity of the fourth country cannot be determined by its relationship to Israel, by the location of Cush, by the land beyond the rivers of Cush or any relationship between these countries. Unfortunately, readers focus on Israel, Cush and the land beyond be fail to stay focused on the country in verses 2-7. This word is mashak (maw-shak') (Strong's Exhaustive Concordance Hebrew Lexicon word 4900) is a primitive root; to draw, used in a great variety of applications (including to sow, to sound, to prolong, to develop, to march, to remove, to delay, to be tall, etc. ):--draw (along, out), continue, defer, extend, forbear, X give, handle, make (pro-, sound)long, X sow, scatter, stretch out. All of these apply to the USA today. Peeled comes from mowrat (mo-rawt') (Strong's word 4178) which is from 'yarat' (3399); meaning obstinate, i.e. independent:--peeled. It can also mean smooth as in a clean-shaven people. "…a people terrible from their beginning hitherto…" refers to a powerful and unconquered nation since its beginning. Psalm 47:2 says, "For the LORD most high is terrible; he is a great King over all the earth". Terrible does not mean bad or evil. Terrible here refers to power and strength to be respected. Some other verses using terrible in this aspect are Deuteronomy 10:17 and 21, Nehemiah 1:5, 4:14 and 9:32, Psalm 45:4, 65:5, 66:3, 68:35, 76:12, 99:3, 106:22 and 145:6. "…a nation meted out . . " uses qav-qav (kav-kav') (Strong's word 6978) from 'qav' (6957) (in the sense of a fastening); stalwart:--X meted out. This is not a dominated nation but instead a dominating country. "…and trodden down,…" uses mbuwcah (meb-oo-saw') (Strong's word 4001) from 'buwc' (947); a trampling:--treading (trodden) down (under foot). This is not a trodden down people but instead it means those who are doing the trodding down and subjugating others. This is more a dominating nation than a dominated nation. What nation has been a powerful conquering nation since its beginning other than the USA? This is referring to a superpower that has never been conquered. It is a nation that has always been on top until the day of its destruction. "…whose land the rivers have spoiled!…" comes from baza' (baw-zaw') (Strong's word 958) which is a primitive root; probably to cleave:--spoil. The rivers divide the country in verse 2. The Mississippi would be well described this way. It physically divides America. In the future it could be even a stronger division if the New Madrid fault acts up damaging all the bridges which connect this country. It has also greatly blessed this country. Poorer countries could say it has spoiled America with wealth. The wealth of nations can also be their downfall. It Will Bring a Present Unto the LORD of Hosts at Mount Zion. Requirement number 7 demands interaction with Israel. Numbers 3 and 4 require this country to be a significant military power, world leader or conqueror that was in power or rose to power after God gave Isaiah the prophecy. What countries can be considered? Egypt had been successfully invaded by the Hyksos prior to Isaiah. The Egyptians were not down trodding but instead had been downtrodden when the Exodus occurred. Solomon also stemmed the Egyptian power during his reign. Requirements three and four do not apply. Therefore, Egypt cannot qualify. Ethiopia has been a favorite of many scholars because of the incorrect translations of the name Cush. This country is not a powerful nation. It is not what is described in verse 2. All other countries in Africa countries do not meet the requirements either. Antarctica - Antarctica is not an inhabited land. Assyria, Nineveh and Babylon had not always been in power but had instead been ruled by others prior to Isaiah's time. China was obscure in Isaiah's time. As of today, it has not been attacked with such a great loss so as to greatly delay or prevent the burying of dead as mentioned in verse 6. It has not been known to bring a present to the LORD in Jerusalem. It was conquered by Japan last century. If it is destroyed in the future it would not be a nation powerful from its beginning. China cannot be the nation this chapter is talking about. Japan is not divided by rivers. It was conquered in 1945 but it did not bring anything to Jerusalem. Russia in the thirteenth century was attacked by the Mongol Empire. The Mongol occupation lasted about 200 years. Russia has not been powerful since its beginning. All other Asian countries have been conquered but not destroyed as described by Isaiah in this chapter. The rivers do not divide Australia. While their strength is to be respected, they have not been the power mentioned in verses three and four. Greece lost its power and was not destroyed as described in verse six and did not bring a present as in verse seven. Rome lost its power slowly. Like Greece, verses six and seven do not apply. Any and all other countries in Europe have been conquered in a manner inconsistent with Isaiah 18. None of these countries could gain power again and say they have been powerful since their beginning. Greenland and all other islands do not meet the requirements. Brazil is divided by the Amazon but is not a super power which dominates other nations. Other countries in South America are not strongly divided by rivers and do not dominate other countries. Mexico, Canada and Central America cannot be considered to be the dominating nation described in Isaiah 18. America is the only nation that is a scattered people, a clean-shaven or smooth people, a powerful and unconquered nation since its beginning, down trodding and subjugating others. The rivers divide it. What nation has been a powerful conquering nation since its beginning other than the USA? America overcame England in its war of independence. It remained after the war of 1812. The Confederate rebels were defeated in the Civil War. It won the Spanish American war, World War 1 and 2. It dominated the Native American Indians, greatly oppressed Africans through slavery and ended Hawaiian sovereignty. It did all it really cared to do in the Korean War, Vietnamese War, Iraq and Afghanistan. The nation that fits this description is the USA. It was non-existent and nameless in the days of Isaiah. The Bible can only be talking about the US. If you do not agree ask yourself why. Is it because you don't want it to happen? I don't want it to come about either but that does not change the facts. Is it because something like this has never happened before? Are you relying on your emotions or what the Bible says? The sad news is it will be destroyed. One scholar I greatly respect is Hal Lindsey. He has a great show weekly that can be seen at The Hal Lindsey Report or at HisChannel Video on Demand. He believes America will collapse economically. I believe that, too but I think a lot more is in store. Charles R. Taylor wrote a book back in 1979, titled, "World War III and the Destiny of America", (ISBN 0-8407-5681-X). If I am reading it correctly, he believed Cush was Ethiopia, and the United States was both the land which sends the messengers and the one which is destroyed. He focused more on a conventional nuclear war rather than a surprise attack from a terrorist nation. While he interpreted the details differently, the result was still the same; America is the nation destroyed in Isaiah 18. I didn't agree with everything in the book, but it may be worth your time to read it. It is out of print, but several on-line book dealers, such as Barnes & Noble, and Amazon, sell copies at good prices. So many are looking for the reason why they cannot find America mentioned in prophecy. One idea is the rapture causes a huge disruption. Others speak of economic collapse. They stay far away from the thought that America will meet an end just like it's enemies such as Iran are talking about. What is the purpose of mentioning the land beyond the rivers of Cush? As it turns out, it is the source from where the destroyers come. It sends messengers to destroy another nation. It will have great woe or sorrow itself but it is not the object of destruction. Most readers believe the land beyond the rivers of Cush is the main land which gets destroyed. The nations in that area do not match the description found in Isaiah 18. Therefore, we know there is another country destroyed not mentioned in verse one. The existence of the messengers gives us a clue as to what happens. Isaiah 18:4 says, "For so the LORD said unto me, I will take my rest, and I will consider in my dwelling place like a clear heat upon herbs, and like a cloud of dew in the heat of harvest." A period of time is coming referred to as the tribulation or the time of Jacob's trouble (Matthew 24:21, 29, Mark 13:24, Revelation 7:14, Jeremiah 30:7). God will not intervene to the good of mankind but instead allow bad things to happen on a large scale. In this chapter something bad happens. What it is we can not exactly say but "clear heat upon herbs, and like a cloud of dew in the heat of harvest" is not presented as a good thing. What is a "cloud of dew in the heat of harvest"? Well, that could be a monsoon rain. It could also be the mist of a chemical weapon. In addition, radiation is a clear heat and in excess produces clouds. Isaiah 18:6 reads, "They shall be left together unto the fowls of the mountains, and to the beasts of the earth: and the fowls shall summer upon them, and all the beasts of the earth shall winter upon them." This describes the result of the destruction. There will be so many dead that the dead cannot be buried. The Hebrew word translated as summer is quwts (pronounced koots - Strong's 6972 meaning to clip off or to spend the harvest season. It is related to qayits (pronounced kah'-yits Strong's 7019) meaning harvest (as the crop), whether the product (grain or fruit) or the (dry) season. Quwts is used only once in the Bible. The timing is also shown by the birds feeding off of the bodies in the summer harvest and the beasts feeding in the winter. This is not an event with thousands dead. The toll would have to be in the millions. When it is done, so many are dead that they will not all be buried. When God does not step in to stop people from destroying themselves or others what do they do? When God rests at this time, evil men will be free to do what they want. Going back to verse two, what do we find? The country of "whirring wings"sends its "ambassadors" to America. It should be no surprise that a nation that lets its guard down would be vulnerable to attack. The borders of America are weaker than ever before with even the top levels of government refusing to defend the country. Isaiah 18:2 says, "That sendeth ambassadors by the sea, even in vessels of bulrushes upon the waters, saying, Go, ye swift messengers, to a nation scattered and peeled, to a people terrible from their beginning hitherto; a nation meted out and trodden down, whose land the rivers have spoiled!" Substituting America for the nation this verse would read, "That sendeth ambassadors by the sea, even in vessels of bulrushes upon the waters, saying, Go, ye swift messengers, to America". This is the agent for its destruction. While God is resting, these messengers bring swift destruction upon America that is described in verse 4. Isaiah 18:5 says, "For afore the harvest, when the bud is perfect, and the sour grape is ripening in the flower, he shall both cut off the sprigs with pruning hooks, and take away and cut down the branches." In the northern hemisphere grapes blossom around April. The earliest harvest grapes used in sparkling wines can occur in late August or early September. Other harvesting occurs through September and into October. Sometime during this period Isaiah 18 will be fulfilled. This could refer to the rapture occurring at this time. The vine and branches that Jesus mentioned at the last supper refer to Jesus and his followers who are removed from the world at the rapture. John 15:1-6 teaches us, "I am the true vine, and my Father is the husbandman. Every branch in me that beareth not fruit he taketh away: and every branch that beareth fruit, he purgeth it, that it may bring forth more fruit. Now ye are clean through the word which I have spoken unto you. Abide in me, and I in you. As the branch cannot bear fruit of itself, except it abide in the vine; no more can ye, except ye abide in me. I am the vine, ye are the branches: He that abideth in me, and I in him, the same bringeth forth much fruit: for without me ye can do nothing. If a man abide not in me, he is cast forth as a branch, and is withered; and men gather them, and cast them into the fire, and they are burned." Romans 11 shows that unbelievers were pruned off and the Christian believers were grafted in. When the rapture occurs the vine will be cut off from the world. Isaiah 18:6 says, "They shall be left together unto the fowls of the mountains, and to the beasts of the earth: and the fowls shall summer upon them, and all the beasts of the earth shall winter upon them." The word quwts is translated as summer in this passage. Strong's Concordance (H6972) lists its first definition as "to clip off". It's what is done in the harvest season. The word charaph is translated as winter. The first meaning of Strong's Hebrew word H2778 is "to pull off". Does this mean the animals will spend the summer and winter feeding on them or does it mean they will cut and pull off the flesh of what is left in the field? From Where Do the Messengers Come? The messengers come from a land beyond the rivers Cush. There are many countries beyond the rivers of Cush such as Iran or Pakistan. If we knew where this country was we might be able to stop some of its agents. We would understand better why and when they would strike. If the fulfillment of this chapter was in the near future we would expect to see a country preparing for war. Readers find the mention of "Ethiopia" in verse 1 and assume that the passage is about it. The passage is not about "Ethiopia". The real name here is "Cush". See Where Is the Land of Cush? The real identity of Cush does not change the reference to America later in the chapter. Cush is a nation that helps identify another nation which is the "land shadowing with wings". The "land shadowing with wings" is not the focal point of this chapter either. Instead, it is a nation that sends its ambassadors to the nation in verse two. The land of whirring wings would be the land beyond the rivers of Cush from the perspective of the people of Israel who were the first intended listeners. In verse 1 "beyond" must mean on the other side of the rivers of Cush or Iraq with respect to Israel; that is, the land east of Iraq. 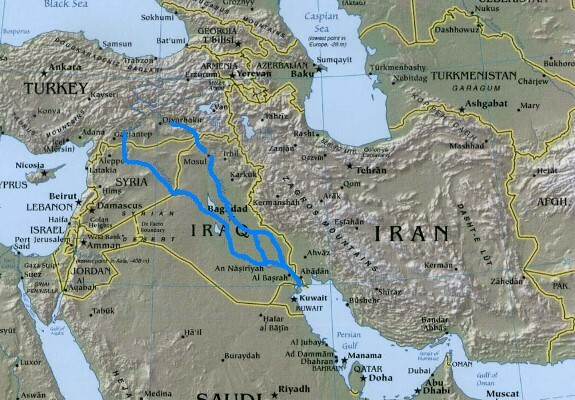 There are two countries that are mentioned in the Bible east of the Tigris and Euphrates: Persia, known today as Iran (mentioned 25 times) and India (Esther 1:1 and 8:9). The country just beyond Cush is Iran. Other countries that are beyond the rivers of Cush are Pakistan, Afghanistan, India at least a dozen more. The country that sends its "ambassadors" to another country in the way described in this passage could be Iran. Today we see an unprecedented threat to America from one of these known as Iran. When Soviet Russia developed its nuclear program America could rely on Russia understanding the principle of mutually assured destruction. Each country knew that a first strike would most likely result in both countries being destroyed. Neither America nor Russia wanted that. What's different today? Iran has entered the picture. Iran does not necessarily believe the theory of mutually assured destruction, and moreover, Iran may not care. It would be an honor for Iran to destroy America even if Iran was destroyed themselves. Iran is not a sane country or a peaceful country. Iran has embarked on a mission to develop nuclear bombs. If Iran wanted uranium for peaceful purposes only, they would let international inspectors verify what they were doing with it. The spin-off technology Iran has procured can be used to separate uranium isotopes needed to make nuclear bombs. Iran is making nuclear warheads. Iran has developed the Shihab or "shooting star" missile for offensive purposes. Here are some reasons to suspect Iran. Iran publicly stated its goal is the destruction of Israel and America. Iran supports Hamas and Hezbollah. It coordinates with Syria. It encourages anyone who wishes to fight with Israel. Some people in Iran believe the Mahdi, an Islamic messiah, will come in chaotic times and that the time is near. Iran continues its enrichment of nuclear fuel against elevating pressure to stop. Iran is showing more military power than before. It is possible. Pakistan, for example, lies beyond the rivers of Cush. Pakistan now has a stockpile of over one hundred nuclear weapons. The power structure of the country shifted when Pervez Musharraf resigned in 2008. Many radical people live in the country and the there is no guarantee of what their goals wills be like in the future. Currently, however, it does not export terror like Iran. In addition, groups such as Al-Qaeda or the Taliban may get help from hostile powers such as North Korea. On Memorial Day, May 25, 2009, North Korea announced it tested an underground nuclear device. They provided advance warning and the USGS verified a 4.7 magnitude event. America is too confident that no other country can touch it. The more weapons America's enemies have the more destruction that can be brought about. The United States must prevent hostile nations from developing nuclear devices. Next, it must prepare to intercept as many messengers, envoys, ambassadors or carriers as possible. Homeland Security is a priority. America has a problem and it has no option to than to deal with it immediately. When the disaster is over the fourth country will bring a present to the Lord in Jerusalem. What is the present? The Bible does not say here. Is it gold, silver or money? Is it a religious relic or artifact? What really matters to God? It would be nice to know. It is important enough to be mentioned in the Bible. Isaiah 18:7 says, "In that time shall the present be brought unto the LORD of hosts of a people scattered and peeled, and from a people terrible from their beginning hitherto; a nation meted out and trodden under foot, whose land the rivers have spoiled, to the place of the name of the LORD of hosts, the mount Zion." One possibility is the rebuilding Jerusalem and the cities of Israel after the great war found in Ezekiel chapters 38 and 39. See The Coming War in Israel. Verse 19 tells us of a great shaking in the whole land. Verse 20 says all men on the face of the earth shall shake. Does "earth" refer to the whole world or the complete land of Israel? With either possibility the minimum extent requires every building in all of Israel to fall. For Israel to continue on new buildings must be built. America may help rebuild Israel. Another possibility is that the present is gold, silver or materials to build a future temple in Jerusalem. God loves people the most. The present might also represent all of the Jewish people living in America. They are worth infinitely more than gold and silver. There is no greater present that you can give to God other than yourself. What about Joseph and Mary? Following the birth of Jesus, Luke 2:22 says, "And when the days of her purification according to the law of Moses were accomplished, they brought him to Jerusalem, to present him to the Lord;" Joseph and Mary presented Jesus unto the Lord (God the father) in Jerusalem. Other than their own lives, this was the greatest gift they could give. God doesn't need our gold, he wants us to return to him. Today when Jews return home to the land of their fathers they often refer to it as an aliyah. You may have seen the Arutz Sheva and Jerusalem Post web sites linking to Nefesh B'Nefesh Aliyah Services. When America is attacked the reason for anyone to stay will be greatly reduced. If millions of Jews returned to Israel it would be a great present unto the Lord and worth more than all the gold and silver in the world. Isaiah 33:6 tells us "the fear of the LORD is his treasure". We need not just a great physical Aliyah (a going up referring to immigration to the land of Israel) but a great spiritual one. When Isaiah 18 is fulfilled, Christians alive in America may not be here. Jesus told his followers that he was leaving the earth but that he would come again. The Bible tells us about what is now calls the rapture. The believers will be removed from the earth and go straight to heaven. Seven years of tribulation and great suffering will follow. If you get saved before the rapture you will avoid the tragedy. We do not know how far this event is in the future. Not everyone alive today will be alive when this catastrophe will be set into motion. If you are alive then you will certainly want to avoid it. If you are not in America you will escape this devastation but not necessarily other wars. If you are in a city that is not attacked you may evade the enemy's envoys. Whether you avoid all the horrors what matters is that you spend eternity in heaven. If the rapture occurred and you are still on the earth you need to get saved today. It profits you nothing to gain the whole world but lose your own soul. While you may be safe or you may get killed, without Jesus nothing else matters. What matters is that you spend eternity with God. God has a son. His name is Jesus. Jesus Is the Messiah. God sent his son to die on a cross and become the ultimate sacrifice. He paid the entire price for our sins on the cross. There is nothing we can do ourselves. We are unworthy. Jesus rose the third day to become the first of the resurrection and prove he is Lord. What really matters in life is whether you accept Jesus as Lord. Life is a test and the only answer is Jesus. Without Jesus it does not matter whether you die in tumult, escape tragedy or live a total life of luxury somewhere else. What matters is that you spend eternal life in heaven. Without Jesus, you will live in hell after you die. Instead, you can call upon the Lord to save you. Salvation is so simple to attain that most people don't want to accept it. It is based on faith. Jesus does all the work. If you want to be saved and have eternal life read about salvation. Isaiah 18:6 says, "They shall be left together unto the fowls of the mountains, and to the beasts of the earth: and the fowls shall summer upon them, and all the beasts of the earth shall winter upon them." Isaiah 17 is about the future destruction of Damascus. The city shall no longer be inhabited but the prophecy does not say how many die. So the same, the Bible in Isaiah 18 omits any reference to the number of dead. Also it does not say all, some, a few, or most of the people in the country will die. There will be too many dead to bury or the bodies will left for the birds for some reason. If this occurs during the seven year tribulation written about in the book of Revelation, it would not unthinkable that millions upon millions would die. One quarter of the earth's population will be destroyed by the "sword, and with hunger, and with death, and with the beasts of the earth." (Revelation 6:8) The actual amount may still be subject to change. It may vary based on the actions of America which has the ability to make changes within its border and influence the rest of the world. In Genesis 19 angels came to take Lot out of Sodom before it was destroyed. Lot's choice saved himself and his two daughters. The book of Jonah 3 tells how Nineveh repented and was spared. A plague ravaged Israel in 1 Chronicles 21. It started when King David numbered Israel. King David and the elders who were clothed in sackcloth, fell upon their faces and sought the Lord. Verse 18 says, "Then the angel of the LORD commanded Gad to say to David, that David should go up, and set up an altar unto the LORD in the threshing floor of Ornan the Jebusite". Following David's sacrifice on the threshing floor of Ornan the Jebusite the plague was stopped. What we do will make a difference in what happens. While the death toll in Isaiah 18 appears to be a large amount, we do not know the exact figures or even have an approximate guess. We do not know the exact targets. Many can be saved if we stop even one of the messengers. The best time to act is now. It is important to read Isaiah chapter 18 completely. Most people make the mistake of reading through the chapter too quickly. Is it possible they are not paying attention because it is talking about a country they are not concerned about? Perhaps you are a scholar who wants to see everything fulfilled in the past so you can explain it. Please take another look. The King James Version (KJV) is included below because copyright permission is not required to use it. The KJV is a good translation because of the texts that were used but it is not perfect. Newer translations may change words in part to help secure a copyright. Copyrights can only be gained from authors for new work or work which is substantially different from the original work. The copies of the Bible we have today in Hebrew are the authority. If the English varies from the Hebrew the English is translated wrong. Many versions I find translate Cush incorrectly as Ethiopia. The New King James Version, Revised Standard Version, New Living Translation, American Stand Version, Reina-Valera (Spanish) and the Latin Vulgate read as Ethiopia. The New International Version, New American Standard Bible, Young's Literal Translation, English Standard Version, Darby Translation and Webster's Bible do not make this mistake. Note the superscripts in the verses below. They shall be left together unto the fowls of the mountains, and to the beasts of the earth: and the fowls shall summer10 upon them, and all the beasts of the earth shall winter11 upon them. Italicized words are words that are not actually present in the copies of the manuscripts but are thought by the translator to be strongly suggested or implied by the text in the original language. See the following list for the Hebrew meaning from Strong's Exhaustive Concordance. Hebrew words are numbered HXXXX. shadowing - H6767 - tslatsal - tsel-aw-tsal' - from 'tsalal' (6750) reduplicated; a clatter, i.e. (abstractly) whirring (of wings); (concretely) a cricket; also a harpoon (as rattling), a cymbal (as clanging):--cymbal, locust, shadowing, spear. wings - H3671 - kanaph - kaw-nawf' - from 'kanaph' (3670); an edge or extremity; specifically (of a bird or army) a wing, (of a garment or bed-clothing) a flap, (of the earth) a quarter, (of a building) a pinnacle:--+ bird, border, corner, end, feather(-ed), X flying, + (one an-)other, overspreading, X quarters, skirt, X sort, uttermost part, wing((-ed)). Ethiopia - H3568 - Kuwsh - kooshv - probably of foreign origin; Cush (or Ethiopia), the name of a son of Ham, and of his territory; also of an Israelite:--Chush, Cush, Ethiopia. note this is different from the what the true scripture says about it in Where Is the Land of Cush? scattered - H4900 - mashak - maw-shak' - a primitive root; to draw, used in a great variety of applications (including to sow, to sound, to prolong, to develop, to march, to remove, to delay, to be tall, etc. ):--draw (along, out), continue, defer, extend, forbear, X give, handle, make (pro-, sound) long, X sow, scatter, stretch out. peeled - H4178 - mowrat - mo-rawt' - from 'yarat' (3399); obstinate, i.e. independent:--peeled. terrible - H3372 - yare' - yaw-ray' - a primitive root; to fear; morally, to revere; caus. to frighten:--affright, be (make) afraid, dread(-ful), (put in) fear(-ful, -fully, -ing), (be had in) reverence(-end), X see, terrible (act, -ness, thing). meted out - H6978 - qav-qav- kav-kav'- From H6957 (in the sense of a fastening); stalwart:- X meted out. trodden down - H4001 - mbuwcah - meb-oo-saw' - from 'buwc' (947); a trampling:--treading (trodden) down (under foot). spoiled - H958 - baza' - baw-zaw' - a primitive root; probably to cleave:--spoil. summer - H6972 - quwts - koots - a primitive root; to clip off; used only as denominative from 'qayits' (7019); to spend the harvest season:--summer. winter - H2778 - charaph - khaw-raf' - a primitive root; to pull off, i.e. (by implication) to expose (as by stripping); specifically, to betroth (as if a surrender); figuratively, to carp at, i.e. defame; denominative (from 'choreph' (2779)) to spend the winter:--betroth, blaspheme, defy, jeopard, rail, reproach, upbraid.